Your Bellaire, Texas business is expanding rapidly. Your older business phone system has put you at a competitive disadvantage when it comes to efficient communication and productivity. Your current system doesn’t accommodate newer technologies like IP and cloud-based systems and it certainly doesn’t integrate with the other computer applications you’ve recently implemented. Deciding to update your business communications system marks the first step to realizing significantly higher productivity and considerably lower telecom costs. In other words, switching to a new, fully integrated telecommunications solution will increase both productivity and revenues. But you’ve got to find the right telecommunications solutions partner to plan and implement the system that fits your needs. Your communications partner should not only provide comprehensive business telephone systems and equipment, but also have extensive experience in structured cabling design and implementation. We also offer state-of-the-art overhead paging and video surveillance systems and develop custom business applications that fully integrate with all technologies, including mobile devices. Choose the team with the experience that will mean the difference between smooth project development and implementation or expending unnecessary time and money with troubleshooting sessions at some point down the road.  Partner with the number one choice for businesses of all sizes – Action Communication.